Words cannot describe how excited I was when I was given the opportunity to try out Palmera. 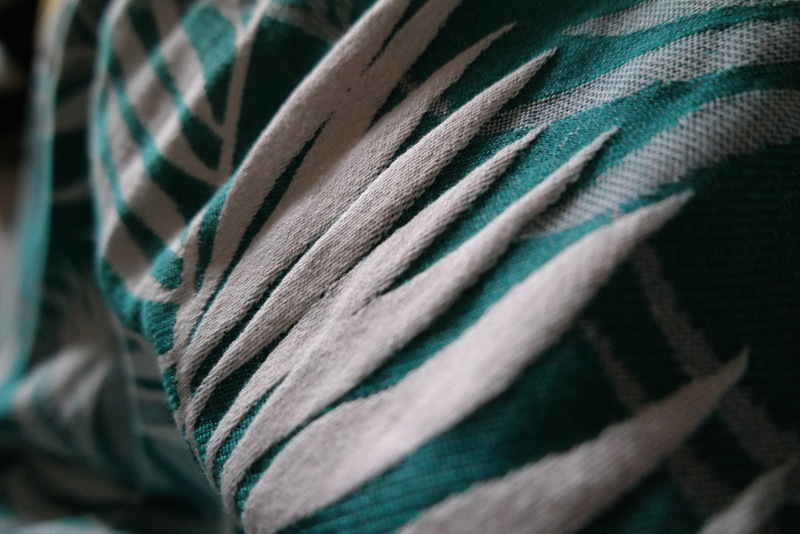 I love the palm leaves on everything right now - furniture, wallpaper, clothes - and I wanted so badly to have it on a wrap. Well guess what? After a wash, Palmera did puff up slightly, but not that much. It was already fairly floppy in loom state, but it definitely softened considerably after wash and wear. I'd say it'll take no time at all for this wrap to be fully broken in, which is a big deal for me because I loathe breaking in wraps - and I know I'm not the only one! Now, a size 7 is NOT my go-to size. At a base +2, I knew that it'd be a challenge to figure out ways to use it while not being completely overwhelmed by the length. Thankfully, Palmera is so thin that it makes it very easy to handle. Even when folded, this wrap doesn't take up as much space as you'd assume for a long length. While Palmera is thin, it also has a dense weave. This translates to an amazing amount of support - perfect for Adam, who is getting heavier by the week! The weave density paired with its thinness means that it's easy to wrap with, without being diggy. 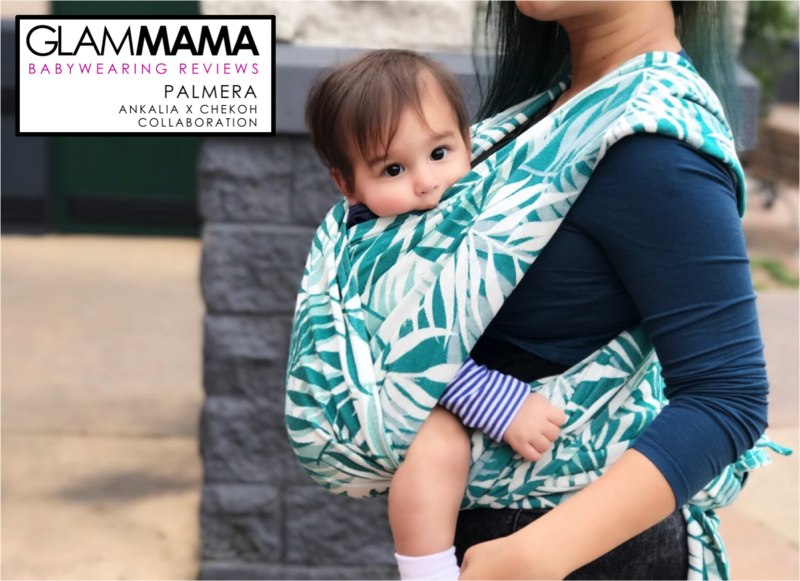 So while Palmera is not what I would call cushy, it is extremely comfortable on my very picky shoulders. I wore Adam for up to 5 hours in this wrap, and there was ZERO sag and absolutely no aches or pains anywhere. I must also mention that Palmera is surprisingly grippy. It does have some texture, but the palm leaf motifs are so large that I don't think it has much to do with the grippiness. However, it's been by experience with Tencel that this fiber can make wraps grippier than you think, so maybe that has something to do with it. 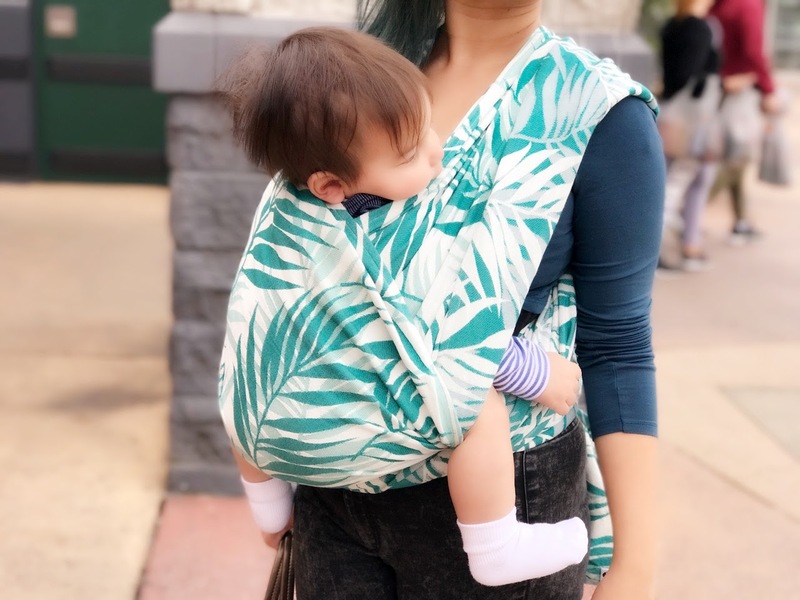 Palmera's grippiness meant that it was very forgiving of sloppy wrap jobs, which I'll admit happened more often than not, given that I'm not used to dealing with that much length in a wrap! I cannot emphasize enough how much I love the looks of Palmera. 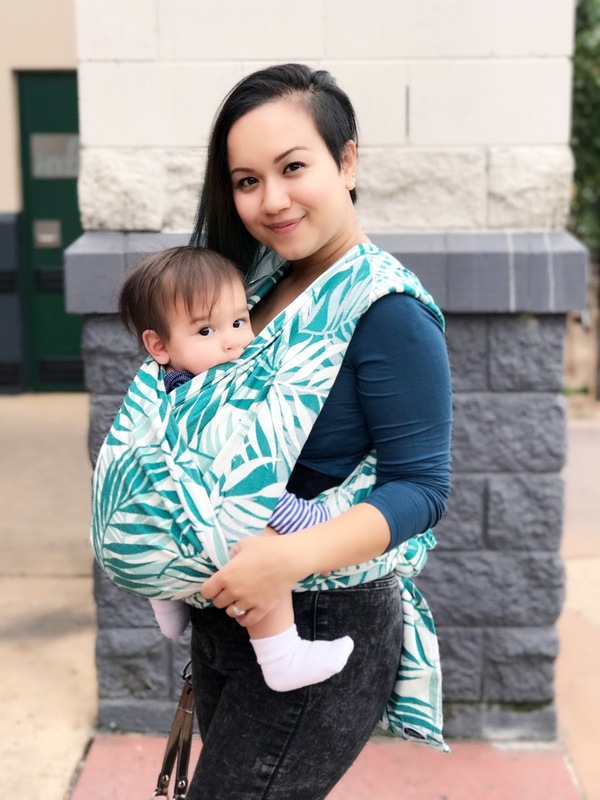 The palm leave motifs are so current yet classic at the same time - there's something about nature-inspired motifs in general that have that quality, sure, but palm leaves and their kin are so chic right now, which makes Palmera especially fashionable. I definitely turned a few heads while wearing it! 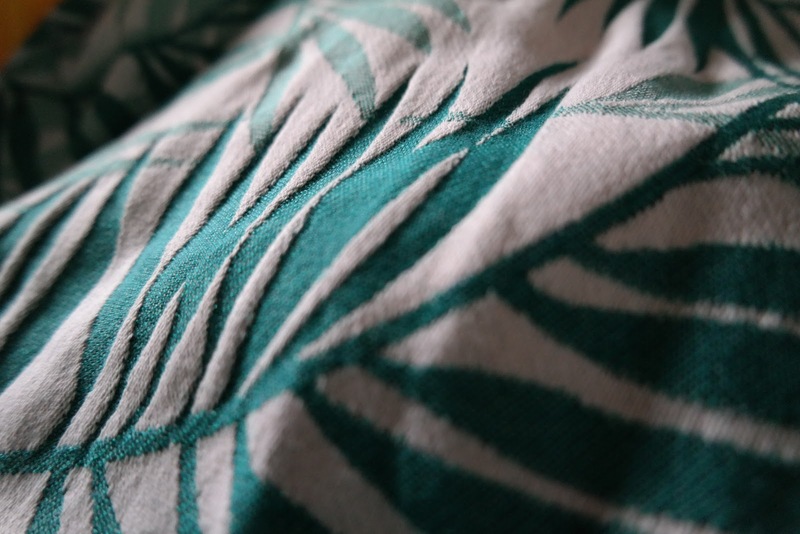 The palm leaves are woven in such a way that it creates a bit of texture, which makes the overall appearance more interesting. 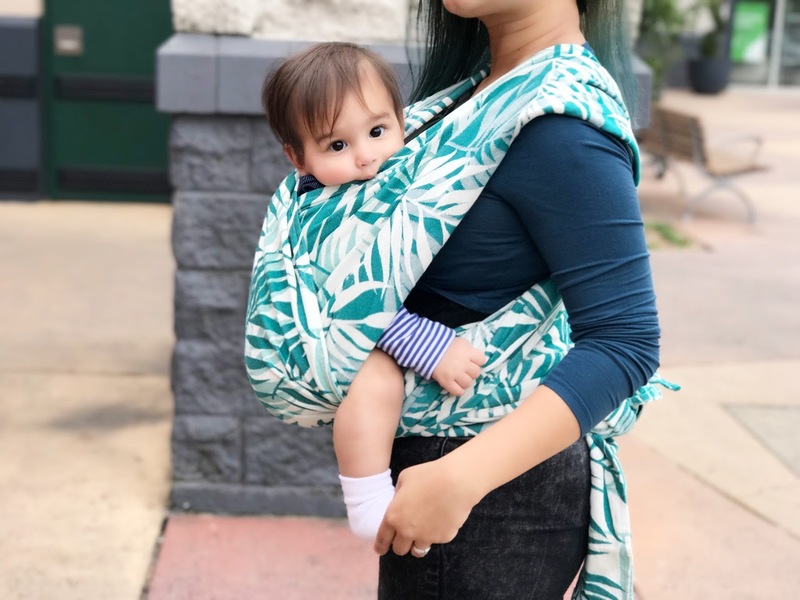 The leaves themselves are different shades of green and teal (which happens to also be the color of my hair right now, which means it is my destiny to have this wrap, am I right?!). Palmera is both fashionable and functional. 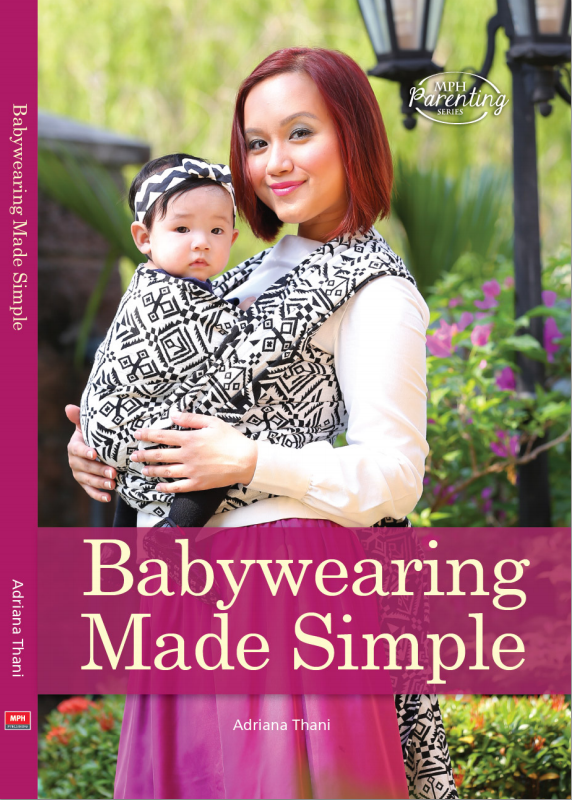 It is suitable for brand new babies to bigger babies. It's so easy to wrap with that beginners and veterans alike will enjoy wrapping with it. Aside from all this, it is super affordable too!!! I want it, and I'm pretty sure you want it too, now. (I'll have you know I briefly considered not publishing this review so that I'd not have to compete with too many people to win the draw to purchase this beauty, lol). You can join the draw to purchase Palmera on the 27th of April - that's in exactly a week! Please click HERE for more information about the release, including the prices (two words: suprisingly affordable). 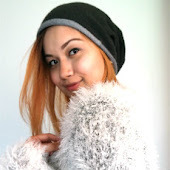 Don't forget to LIKE Ankalia's Facebook Page HERE and Chekoh's Facebook Page HERE. Don't forget to turn on notifications for both pages so you don't miss this release - it's a limited edition, which means only 30+ wraps are being released! Also don't forget to join the chatter pages Ankalia Embraced and Ankalia Abroad so you can see more photos and reviews of Palmera! 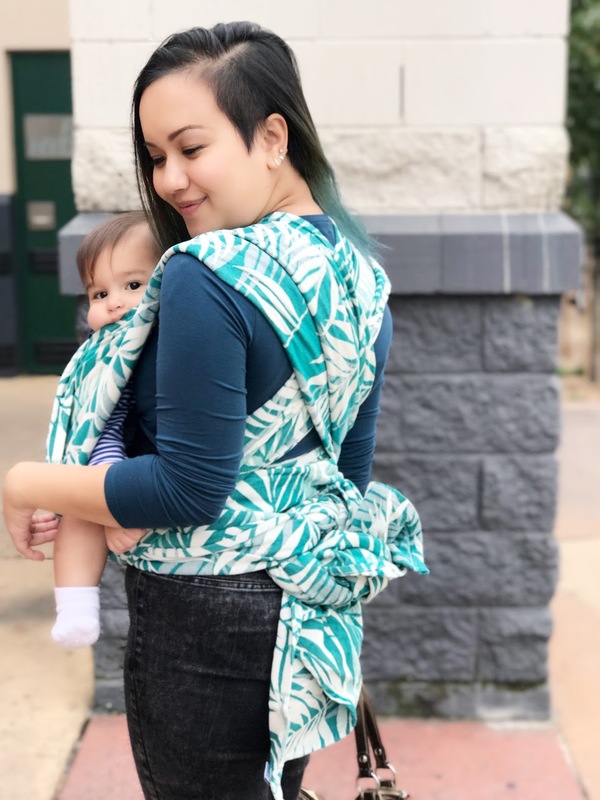 Please CLICK HERE to see more Babywearing Reviews!